If you are missing only one or two teeth, there are two excellent options for replacing those teeth. You can have a dental bridge or a dental implant. A dental implant consists of a root form that is surgically placed in the jaw. After it heals, a false tooth is placed on the implant. The result looks very natural, and it functions much as a natural tooth does. A dental bridge involves suspending a false tooth between two crowns. The adjacent teeth are prepared for dental crowns, an impression is taken, and the case is given to a dental laboratory technician. The laboratory technician then makes the bridge, which is a single piece, and it is cemented onto your teeth. It is less a less aggressive treatment—less invasive. Nothing has to be done to the adjacent teeth. There are fewer chances for complications down the road. With a bridge, if anything happens to any one of the three teeth, such as new decay, the entire bridge has to be replaced. 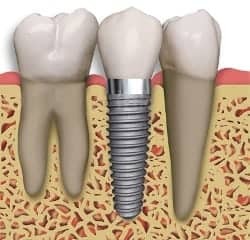 With an implant, for any problem with one tooth, the solution will likely involve only that tooth. The presence of the root form not only helps the result look more lifelike, but it helps preserve the bone where the missing tooth used to be. Without the root form, that bone gets reabsorbed by the body and shrinks over time. It is easier to clean and maintain. There is no waiting time for healing. A dental implant may require several weeks to heal. During the interim, you need to wear a temporary tooth. It is usually less expensive. Your dental insurance will probably pay benefits for the least expensive tooth replacement option, so the extra expense for a dental implant may be entirely your responsibility. 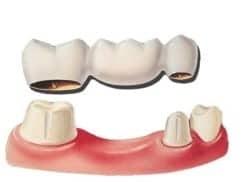 If the teeth on either side of the missing tooth have large restorations or need crowns anyway, a bridge may be the most sensible option. If you would like to find out if a dental bridge or implant is right for you, call us at 630-717-9499 or click here to request an appointment online.